Delays and confusion are being reported out of Orlando International Airport after the death of TSA agent Saturday morning. ORLANDO, Fla. (AP) — Delays and confusion are being reported out of Orlando International Airport after the death of a TSA agent Saturday morning. The Orlando Police Department tweeted that a TSA employee, a man in his 40s, was found in critical condition after jumping from the Hyatt Regency Hotel, which is located inside the airport, into the atrium where passengers wait to get through security. He was taken to the hospital where he was pronounced dead. 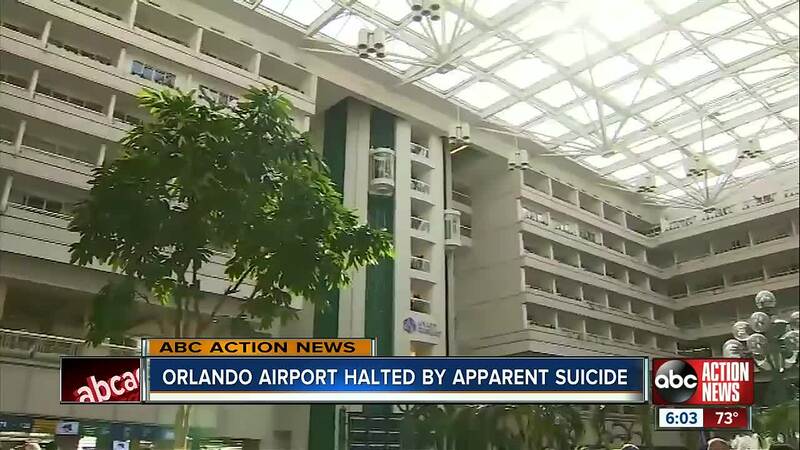 "The TSA confirms that an on-duty officer fell from a hotel balcony inside Orlando International Airport this morning and is deceased. Our thoughts and prayers go out to the officer’s family, friends and everyone in our TSA family. At the time of the incident, several passengers scattered into the sterile area unscreened. TSA will be rescreening passengers and will continue to work with the Orlando Police Department and GOAA (Greater Orlando Aviation Authority) to return operations to normal." Passengers in the airport were sharing pictures and videos on social media of the confusion and back ups caused by the incident. Passengers on shuttles to gates had to be brought back for a second screening, bringing security checkpoints to a temporary standstill. "All passengers at gates 70-129 are being rescreened to insure there are no security breaches. The Operations for gates 1-59 are proceeding as normal. In an abundance of caution, all passengers are being rescreened and in bound aircraft for airsides 2 and 4 may be delayed. Allow extra time for screening as some there may be delays in the process," A spokesperson for Orlando International Airport said. The affected shuttles lead to half the gates at the airport, and the standstill caused major delays for passengers.